This blog, which focuses mainly on money supply (using my own measure) has been silent for more than a year. The reason was that there was little to write about. Money supply growth which had fallen steadily from a high of 22.4% YoY in February 2014 to 0.9% in October 2015 went into reverse gear and rose rapidly. Since July 2017, however, money supply growth has been again falling. At the end of January this year it stood at 11% and seems poised to fall further when the Fed Funds Rate is raised again. As the graph below shows, when money supply growth draws close to the 0% mark, nasty things begin to happen. We are a long way above that right now. 3. 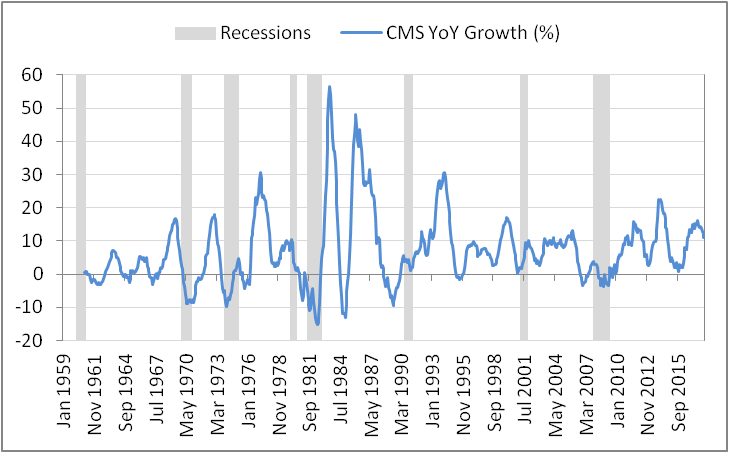 Does the maximization principle break down during recessions?